The Buffalo Philharmonic Orchestra has struck a chord both artistically and financially with its supporters. In its just-completed fiscal year, the orchestra saw attendance increase by more than 11.5 percent to a record 212,114 people attending at least one of its 129 performances. Financially, the BPO finished slightly in the black. “It was a fantastic year for so many reasons,” said Dan Hart, executive director. The orchestra finished its 2016-2017 fiscal year, which ended on Aug. 31, with $11.6 million in revenues and almost the same amount in expenses. “We finished with a very slight surplus,” said Stephen Smith, chairman of the Buffalo Philharmonic Orchestra Society board of trustees. Including revenues, endowment, pledges and assets from its ongoing Crescendo fund raising campaign, the orchestra has approximately $40 million in assets and on its way to reaching a $50 million in total assets goal — roughly five times its annual budget. Smith said the board’s goal continues to focus on growing the orchestra’s audience, “developing and growing artistically” and operate in a fiscally responsible manner. The orchestra generated $4.3 million, which accounted for 37 percent of its $11.6 million total revenues. Earned revenue topped off at $4.4 million, or 38 percent, of the total revenue. Government and public contributions accounted for $1.15 million, or 10 percent, of the orchestra’s revenues while endowment income was $1.75 million, or 15 percent of the total 2016-2017 revenues. On the expense side, the largest was $7.2 million allocated for paying the orchestra, its guest artists and visiting conductors. That accounted for 62 percent of the orchestra’s $11.6 million in expenses. Of its 129 performances, spread over a negotiated 38-week season with the musicians, 38 were traditional classics concerts, 26 were rock or Pops series shows, six were family concerts, 32 were education programs for school children from kindergarten to high schoolers and 12 each with summer or “tour” concerts. The classics attracted 45,617 music lovers while the rock or Pops concerts drew 43,125 patrons. Education shows attracted 51,573 students. “Consider in 2004, we had just 14,000 students attend one of those shows, it demonstrates how we’ve grown with our outreach,” Hart said. The summer shows attracted 55,335 including large crowds at a June 30 Canalside show and the July 28 “Enlighten” concert at the Hotel Henry. “Taken together, it shows how we continue to evolve and play an important role in the community,” Hart said. After several years of uncertainty, the Buffalo chapter of the American Red Cross can now rest assured it will be staying indefinitely in its Delaware Avenue home – along with some musical accompaniment. John Yurtchuk, a developer and former chairman of the regional Red Cross chapter, is buying the prominent Clement Mansion from the nonprofit he used to lead. In a surprise move, Yurtchuk will split the property and donate the historic mansion to the Crescendo Campaign for the Buffalo Philharmonic Orchestra, of which he is also a board member. The BPO will occupy part of the building for its administrative offices and will lease the rest to the Red Cross. The highly complicated but carefully orchestrated transaction – which represents one of the biggest donations in the BPO’s history – will be announced from the stage at the orchestra’s opening performance on Saturday night. The developer’s gift, which he valued at $2.5 million, continues a legacy that began when Carolyn Tripp Clement first donated the 17,000-square-foot mansion to the Red Cross in 1941. The nonprofit has been occupying the building ever since, but no longer uses the entire building, let alone the rest of the property. “We are very proud to still be able to have a presence in the City of Buffalo, to be able to continue to honor this gift that was made 76 years ago,” said Jay Bonafede, spokesman for the Western New York Region of the American Red Cross. As for the rest of the site, Yurtchuk will split off the mansion and front lawn on Delaware from the back of the sprawling property, which includes the main parking lot and three larger buildings. He hopes to redevelop that complex for office, medical or other commercial tenants. He is also considering developing it as a nonprofit campus or incubator, in partnership with the Oishei Foundation. Yurtchuk would not disclose the purchase price for the entire four-acre property. The purchase is expected to close in mid-October, when the BPO will take over and move in. At that time, the Red Cross will shift to the third floor, while the orchestra occupies the second floor and some mezzanine space. The first floor includes three conference rooms that will be shared, as well as a couple of additional offices that the Red Cross will retain. Between the two agencies, about 50 people will work in the mansion, and the organizations will also share the basement storage. The developer is not putting any restrictions on the property, which he said he must legally own for 366 days prior to the donation, for tax reasons. The orchestra will not have any mortgage, saving them significant money over the rent they now pay for leased space on the second-floor of 499 Franklin St., at Allen Street. And the Red Cross will pay a lower rent than the mortgage it now has, reducing its own costs, Yurtchuk said. Yurtchuk has arranged for engineering firm EFS to manage the property for the BPO. The firm, based in Cheektowaga, manages Yurtchuk’s Dent Tower in Amherst, as well as the Saturn Club and the Darwin Martin House. He’s also seeking approval from the Buffalo Zoning Board of Appeals and Buffalo Planning Board, including permission to formally subdivide the property into two pieces. The front portion that will be donated, with 1.15 acres, will include the mansion and front lawn along Delaware. The rear property, with 2.848 acres, will contain the two-story office building in back, as well as a carriage house and the parking lot. That’s what Yurtchuk will keep. The two-story building, along with an adjoining structure connected by an atrium, total 53,500 square feet of space. Built in 1979, it was formerly the Red Cross’ Blood Services building, but is now completely empty and “needs to be repurposed,” Yurtchuk said. The one-story carriage house, which used to have a tennis court and smoking room, is “completely dormant” and would have to be gutted, he added. It’s that rear portion that could become a home for nonprofits, following a model used in other cities. Yurtchuk said Oishei is looking at that option to support other agencies, but has not made any commitments. The Clement Mansion, at 786 Delaware Ave. just north of Bryant Street, was designed by prominent architect E.B. Green and built in 1912. It served as the family home for 37 years, hosting social functions, musical performances and other gatherings of leading city figures. The house included a two-story “music room” on the first floor – now one of the meeting spaces – that once housed two concert pianos and a pipe organ. Carolyn Clement was classically trained, and both Clement sisters played. BPO musicians even performed at the house. That makes the BPO’s new presence even more fitting, Yurtchuk noted. Indeed, Hart said the orchestra hopes to make use of it. The purchase resolves questions about the property’s future, which arose after the Red Cross put it up for sale two years ago after its national parent directed all chapters to sell their real estate. The agency tried to sell to the Erie County Industrial Development Agency, which had proposed a shared campus for nonprofits, but that idea fell through. That’s when Yurtchuk became involved, when Red Cross officials contacted him for advice on a sale. Coincidentally, Hart also called him, because the BPO wanted to find new space that stood out and fit its mission. The orchestra takes care of Kleinhans Music Hall, but the building is owned by the city. There are unseen heroes in the orchestra family. Some of the Buffalo Philharmonic Orchestra’s heroes work in the basement of Kleinhans Music Hall, but now they are being brought out into the light. The BPO has named its music library after Bradford Lewis following a substantial gift to the orchestra. “Without classical music, I wouldn’t be sane. I’ll just put it that way. It’s that important,” said Lewis. Lewis has been a subscriber to the BPO since 1969 and has seen how far it has come. Lewis said a team effort is what has propelled the BPO ahead in recent years, emphasizing the impact of Executive Director Dan Hart. “That combination that she’s formed with Dan has really given us a very strong financial organization for the first time. You are really feeling, ‘We’re not in trouble. We can breathe this week.’ It’s a very rare feeling,” said Lewis. But it takes more than just a conductor and players to make an orchestra work. Lewis knows this firsthand having spent 15 years volunteering with the music collection at the Buffalo and Erie County Public Library. He said the BPO’s two full time librarians, Patricia Kimball and Travis Hendra, are people who make the orchestra go. “The music library down here is one of our nerve centers of the orchestra. It’s really important. Without our librarians, we wouldn’t be on stage,” said Hart. Falletta said her job wouldn’t be possible without their efforts. What the librarian job entails may be more involved than most would think. Kimball has been working with the orchestra for 31 seasons and has witnessed its growth. Hendra said the library has several works that are rare and hard to replace. It’s their job to make sure they stay in proper shape. In an age where everything seems to be going digital, physical copies of music still reign supreme in the orchestra world. Lewis’ contribution will be used in any way that can help the orchestra as a whole, but overall it helps sustain a strong classical presence here in Buffalo. When together in the same room, it is easy to see how they all share similar visions. Being recognized is nice, but for Lewis it is about keeping music alive through community support. In addition to his involvement with the BPO, he is a longtime listener and member of Classical 94.5 WNED. He sees similarities in each for how funding is accomplished. Hendra points out the intimate relationship the classical community now has with their audience in Buffalo. At the end of the day, hearing the music thrive is all that Lewis wants. “The only reason that (name on the door) ended up was that they gave me several alternatives which involved getting up on a stage, and I said no,” Lewis said, to laughter. This contribution is part of the BPO’s Crescendo Campaign which began in 2014. The goal is to increase the orchestra’s endowment to provide a stable, renewable source of income for the organization. The campaign has currently raised $27 million of its $30 million goal. Congrats to our long-serving musicians! On June 3, 2017, we honored four musicians who were celebrating an anniversary with the orchestra. Cellist Robbie Hausmann joined the BPO in 1982 under Julius Rudel. He is one of only a few musicians in the orchestra who are native Western New Yorkers. He studied at Juilliard and at Eastman, and serves as associate director of the Buffalo Chamber Music Society. He also has a strong interest in lesser-known Jewish composers, and has presented recitals in collaboration with pianist Alfred Frenning for 20 years. Violinist Robert Prokes joined the BPO in 1982 under Julius Rudel. He attended Wichita State University and studied with legendary violin teacher Sally Thomas post-graduate. He grew up in a musical family, and replicated that as an adult: his wife Patricia teaches at City Honors and the Buffalo Montessori School, and his daughter Megan is also in the BPO violin section, while his other daughter Tea is Associate Concertmaster at Toledo Symphony and a first-call substitute for the BPO. He maintains a private chamber studio and gathers with friends to play chamber music regularly. Violinist Alan Ross rounds out the “class of 1982,” having also joined under Julius Rudel. He attended the Cleveland Institute of Music, the Philadelphia Music Academy and the University of Cincinnati College Conservatory of Music. Prior to his tenure in Buffalo, he lived in Venezuela for three and a half years, and played in two different orchestras during that time. He taught at Eastman and SUNY Fredonia, and now teaches out of his home. He spends a great deal of his free time with his two grown children and his two grandchildren, all of whom have settled in the area. Violist Matthew Phillips joined the BPO in 1997 under Maximiano Valdes. Phillips also grew up in Western New York. He studied at Cleveland Institute of Music and The New England Conservatory, and was a finalist in the 1992 William Primrose International Viola Competition. He is married to Rachel Kregal, whom he met while they were both students playing in the Greater Buffalo Youth Orchestra. Phillips is an avid runner, and has qualified twice for the Boston Marathon. In 2007, he was the second place age group winner in the Buffalo News Runner of the Year race series. BUFFALO, NY – Bill Murray’s fans know to expect the unexpected from the multifaceted comedian and actor. Murray became famous on “Saturday Night Live,” and cemented his reputation with blockbuster comedies like “Ghostbusters,” “What About Bob,” and “Groundhog Day.” In recent years, he’s become equally as well-known for his serious work in films like “Lost in Translation” and “Broken Flowers;” for his passions for baseball and poetry; and for delighting his fans with surprise encounters. But it was a surprise encounter of his own that led Murray to venture into classical music. Four years ago, Murray was seated across from cellist Jan Vogler on a transatlantic flight. The two men struck up a conversation, and then a friendship. They bonded over a shared love of poetry, and decided to embark on an artistic collaboration. On October 11, Murray and Vogler bring “New Worlds” to Kleinhans Music Hall. The simple title speaks to both the project’s origins as a collaboration between two different artistic worlds, and to the theme of the project itself. “New Worlds” uses chamber music performed by Vogler, violinist Mira Wang and pianist Vanessa Perez and literary readings by Murray to communicate America’s core values. The program seeks to illuminate the ties between great American authors and composers, and explores how they reinvented European traditions in music and literature to create a wholly American aesthetic. Jan Vogler began his career as principal cellist of the Staatskapelle Dresden, and left to focus on solo work. He has been Artistic Director of the Moritzburg Festival near Dresden since 2001. In 2006, he received the European Award for Culture and in 2011 the Erich-Kästner Award for tolerance, humanity and international understanding. Vogler plays the 1707 ex-Castelbarco/Fau Stradivarius cello. Violinist Mira Wang, a native of China, is the winner of the International Violin Competition in Geneva and the First Prize of the International Violin Competition in New Zealand. She gave the premiere of Wolfgang Rihm’s “Duo Concerto” on three continents in two months, and is featured on multiple recordings for Sony Classical and Berlin. She and Vogler are married and are at home in New York City with their two children. Venezuelan pianist Vanessa Perez holds degrees from the Royal Academy of Music and Yale University, and has released a number of solo and collaborative discs. In addition to her thriving chamber and recital career, she was also seen on the Amazon TV show “Mozart in the Jungle” last December. The project premiered on June 4 at the Dresden Festival in Germany, and makes its United States debut on July 20 at the Festival Napa Valley in California before heading east to Chicago, Toronto and New York City’s Carnegie Hall. Their Buffalo stop takes place on October 11 at 8 p.m. in the Main Hall at Kleinhans Music Hall, 3 Symphony Circle, Buffalo. The BPO is not part of this performance. Tickets range from $59 to $99. A limited-availability Platinum VIP package is available for $250, and includes premium seating, a poster, and an exclusive meet-and-greet. Tickets go on sale at 10 a.m. Friday, June 9 and are available online at bpo.org, over the phone at (716) 885-5000, or in person at the Kleinhans box office. When Klaus Heymann, founding chairman of Naxos, asked the Buffalo Philharmonic (BPO) to record the seven orchestral interludes from Wagner’s Ring cycle, he set in motion a series of events that resulted in an extraordinary and highly unusual concert programme. The BPO and music director JoAnn Falletta always present an upcoming CD programme in concert form before producer Tim Handley makes the recording; in this way the Buffalo audience is given a first glimpse into the music that will become the orchestra’s next release. They await the arrival of the finished product with great anticipation, and feel that they have had a real part in experiencing the music that will document the next phase of the musicians’ relationship with Naxos. Very often, Falletta spreads the repertoire throughout the season as a kind of a yearlong “voyage of discovery”, but in the case of Wagner’s orchestral selections she pursued a different approach: to present all of the Ring orchestral sections in one concert, in the order in which they appear in the operas, creating a two-hour symphonic odyssey of power and beauty. Many believe that Richard Wagner lavished his greatest genius on the purely orchestral sections in the operas, creating a world of magical orchestral sound that had never been conceived before. In Wagner’s hands, the orchestra glows with colour and imagination, extending and enhancing the story with astonishing musical poetry. Falletta and the BPO believed that the music on its own could spin Wagner’s wonderful tale of Teutonic gods creating heaven and earth (only to destroy them through greed, jealousy and war), transporting the audience from the music of Das Rheingold, through Die Valkyrie and Siegfried, to the final scene of Götterdämmerung. To ensure that the wonder and magic of this fairy tale was potently clear, however, narration was constructed to underscore the connections between the musical selections. Actor Doug Zscheigner spoke with eloquence, emotion and power as he wove the tale around the music. The final touch was a bold experiment in light and colour: a group of artists, designers and animators was engaged to create a moving “light show”, focused directly on the architectural design of Kleinhans Hall, “light-mapping” the stage with images of Wotan, Brünnhilde, Siegfried and other characters, all set in enchanted landscapes. The result was a BPO presentation that astounded and thrilled the audiences, presenting the story and music of The Ring of the Niebelung in an unforgettable production. To maintain Wagner’s masterful music as the focal point, the stage was darkened in between the orchestral interludes, while Zscheigner and the light artists spun the magical tale. An indication of the magnificence of the visual enhancement can be seen in the selection of images reproduced here. JoAnn Falletta and the BPO once again express thanks to Klaus Heymann for inspiring them to new levels of imagination and creativity in their joint ventures with Naxos. Timpani roll, please. And better beat the snare drum, too. The theme of the Buffalo Philharmonic Orchestra’s 2017-2018 season, just announced, is America. The Classics season kicks off on Sept. 16 with a rare appearance by German superstar violinist Anne-Sophie Mutter, playing Tchaikovsky. But after that, the orchestra begins a two-week celebration of American masters. From then on it’s full speed ahead, as the BPO perform some of the best music of both the Old and New Worlds. “What was in my mind was America – a tribute to our country, this year,” said JoAnn Falletta, the BPO’s music director. She pointed out that 2018 marks the 100th birthday anniversary of Leonard Bernstein, a milestone that sparked the tribute. Bernstein played a unique part in the evolution of music in America. Copland’s Symphony No. 3 is in the offing. So is “The Grand Canyon Suite” by Ferde Grofe, a lovely classic more famous in the ’50s than now. A Gershwin program spotlights the in-demand young pianist Conrad Tao. Another much-talked-about pianist, Charlie Albright, is also playing Gershwin. 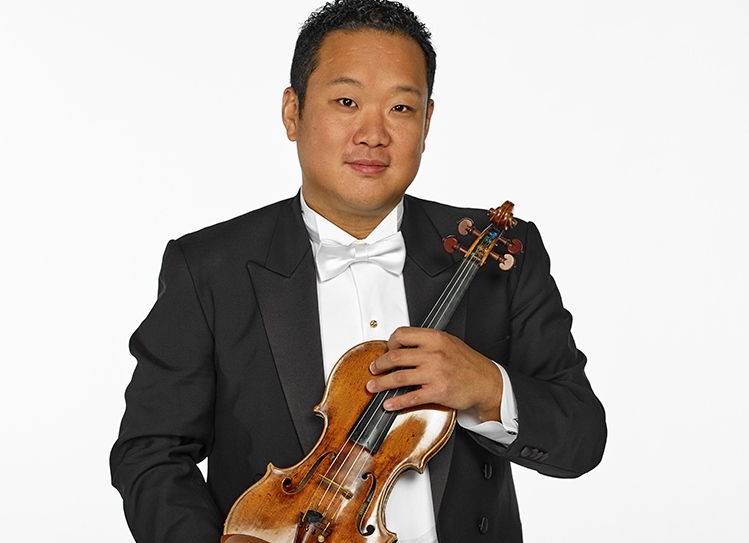 Dennis Kim, the BPO’s concertmaster, is performing a violin concerto by Philip Glass. Grammy-winning electric bass player Victor Wooten, known for his association with Bela Fleck, will be joining the BPO to perform a concerto he wrote. European classics also shine throughout the season, and provide an ongoing juxtaposition. But the American thread surfaces, again and again – sometimes in subtle ways. Berlioz’s “Harold in Italy” will be performed by famed violist Roberto Diaz on an extremely rare Stradivarius viola once owned by Buffalo music patron Cameron Baird. Alex Jokipii, the BPO’s principal trumpet, is performing a concerto by a Finnish composer. Jokipii left Finland to come to America. The seasons ends with the beautiful “Rhapsody on a Theme of Paganini” by Rachmaninoff, who sought refuge in America after fleeing the Bolsheviks in Russia. Poignantly, a concert in April 2018 pairs Dvorak’s “New World” Symphony with a work by Peter Boyer that explores Ellis Island. Principal Pops Conductor John Morris Russell, who will be beginning his third season with the BPO, shares her inspiration. The Pops concerts, too, shine with American identity. The season itself opens with a blast of American pop culture, with the orchestra accompanying excerpts from Disney’s “Fantasia.” In a new twist, Russell is also conducting a Halloween-themed Cirque de la Symphonie event. Another twist is in store for “John Morris Russell’s Holiday Pops.” The extravaganza will feature “The Polar Express,” with the gorgeously illustrated book accompanied by the rich score from the movie. Latin music gets the limelight when the BPO welcomes the Mambo Kings. The sound of Harlem in the 1920s comes alive in a tribute to Duke Ellington and Cab Calloway featuring Byron Stripling. A singer and tap dancer will help re-create the atmosphere of the Cotton Club. And in what promises to be a boisterous event, April 2018 will bring “Buffalo Sings.” The Buffalo Philharmonic Chorus join the BPO and other choirs to celebrate, as the BPO puts it, the songs we all love to sing. The audience gets to sing along. Online auditions beforehand will help determine the “Buffalo Sings” champion, who will ultimately sing native son Harold Arlen’s “Over the Rainbow” with the orchestra. Russell is conducting a good portion of the pops concerts, and is emotionally involved with all of them. Seen side by side, the classics and pops seasons add up to what promises to be a grand adventure. Starting Sept. 16, when the BPO opens the doors for Anne-Sophie Mutter, the orchestra is going for excitement. Mutter, who was a protégé of the legendary conductor Herbert von Karajan, is a jet setting figure known both for her adventurous musicianship and strapless gowns. This will not be Mutter’s debut with the BPO. She was here once before, Falletta pointed out. Mutter played Mozart’s Violin Concerto No. 4 in 1988 under the baton of Semyon Bychkov, who was then the orchestra’s music director. Here is the schedule. For tickets or info on BPO events, call 885-5000 or visit bpo.org. 8 p.m. Sept. 16: Anne-Sophie Mutter is the soloist in Tchaikovsky’s Violin Concerto for the BPO’s season-opening gala. Also, Brahms’ “Hungarian Dances” and Weiner’s Hungarian Folk Dance Suite. 10:30 a.m. Sept. 29, 2:30 p.m. Oct. 1: Pianist Charlie Albright joins the Buffalo Philharmonic Orchestra and Chorus in Gershwin’s “Rhapsody in Blue.” Also, Duke Ellington’s “New World A-Comin’,” John Adams’ “Short Ride in a Fast Machine,” and Copland’s Symphony No. 3. 10:30 a.m. Nov. 17, 8 p.m. Nov. 18: Maximiano Valdes, former BPO music director, leads the orchestra in Tchaikovsky’s “The Tempest”; Lalo’s Cello Concerto, Liadov’s “The Enchanted Lake,” and Debussy’s “La Mer.” Julian Schwartz is the cello soloist. 8 p.m. Dec. 2, 2:30 p.m. Dec. 3: Andre Raphael conducts Ravel’s “Le Tombeau de Couperin”; Mozart’s “Jupiter” Symphony; and Mendelssohn’s Violin Concerto, with soloist Arnaud Sussmann. 8 p.m. Jan. 27, 2:30 p.m. Jan. 28: Andrew Bisantz conducts a Mozart birthday celebration featuring vocal selections from his great operas. 8 p.m. May 12, 2:30 p.m. May 13, 2018: Orff’s “Carmina Burana” and Kuusisto’s Trumpet Concerto, with Alex Jokipii, soloist. 8 p.m. Oct. 14: Stefan Sanders conducts Latin music featuring the Mambo Kings. 10:30 a.m. Oct. 27, 8 p.m. Oct. 28: Russell conducts Cirque de la Symphonie. 8 p.m. Nov. 11: Stefan Sanders conducts a tribute to Neil Diamond. 10:30 a.m. and 8 p.m. Dec. 15; 8 p.m. Dec. 16; and 2:30 p.m. Dec. 17: John Morris Russell’s Holiday Pops. 8 p.m. Jan. 20, 2018: Byron Stripling, “A Night at the Cotton Club.” Stripling has worked with the Count Basie Orchestra and the bands of Dizzy Gillespie and Dave Brubeck. 10:30 a.m. Feb. 16; 8 p.m. Feb. 17: Sanders conducts a concert featuring the Glenn Miller Orchestra. 8 p.m. March 3, 2018: Russell conducts “A Night at the Oscars,” Oscar-winning music from the movies including “Ben-Hur”; “Breakfast at Tiffany’s”; and “Titanic”; as well as “Star Wars” films. Patrons are invited to walk the BPO’s Red Carpet and meet Russell at an Oscars party after the concert. 10:30 a.m. April 27, 8 p.m. April 28, 2018: Sanders conducts A.J. Swearingen and Jayne Kelli in a tribute to James Taylor, Joni Mitchell, Carole King, Jackson Browne, and other great 1970s singer/songwriters. Carl V. Mazzio of Snyder was the principal trombone of the Buffalo Philharmonic Orchestra from 1995 to 2001, when he was forced to retire due to a medical condition. He died on January 17, 2017. Hailing from Portland, Ore., he graduated from Sunset High School in Beaverton, Ore. Following high school he received his Master of Music degree from the Juilliard School of Music, and his Bachelor of Music degree from the San Francisco Conservatory of Music. While a student, he performed with National Repertory Orchestra, National Orchestral Institute, Music Academy of the West, Roundtop Festival and at Tanglewood. Mr. Mazzio was in his sixteenth year at the State University of New York at Fredonia where he was on staff as trombone instructor, Wind Symphony conductor, All College Band conductor and Fredonia Trombone Choir musical director. While at Fredonia, he conducted over five hundred compositions, comprising much of the major band repertoire. He also acted as interim conductor for the University at Buffalo Concert Band numerous times. He was an active honor band clinician throughout New York State and a regular adjudicator at various festivals and competitions. Mr. Mazzio directed the Jazz Band at Williamsville East High School, and taught at DaVinci High School, Buffalo City Schools. He was a fellow at the 2007 Conductor’s Institute at Bard College and was the only American conductor selected to participate in the 2012 Sherborne Summer School, directed by Timothy Reynish in Sherborne, England. He has also participated in the conducting symposiums of Eugene Corporon, Mallory Thompson, Gary Hill, Craig Kirchhoff and Paula Holcomb. Additionally, he taught a full private brass studio at his residence in Snyder. He had the privilege to work with many orchestral conductors and musicians including Kurt Masur, Herbert Blomstedt, Mstislav Rostropovich, Itzhak Perlman, Yo-Yo Ma, Jessye Norman, Doc Severinsen, Aretha Franklin and Tony Bennett. Mr. Mazzio recorded on the NAXOS label and was a featured soloist on numerous occasions. Most notable was his performance of the Leopold Mozart trombone concerto, the first trombone concerto programmed in the orchestra’s history. Prior to this, he held the same position with the New Haven Symphony (1990-94). He has also performed with the San Francisco Symphony, American Symphony, San Francisco Opera, Sacramento Symphony, San Francisco Brass Quintet, Hartford Symphony, Delaware Symphony, Orquesta Sinfonica de Minoria (Mexico City), Carmel Bach Festival (CA), California Symphony, Philharmonia Virtuosi (New York City), Bard Festival, at the Evian Festival (Evian, France), Fantasy Recording Studios (Berkeley, CA), on NBC’s Wide World of Sports, and for Pope John Paul II at Candlestick Park. He enjoyed spending time with his son Clark and girlfriend Julie. He also took pleasure in hiking, wine, cars and spending time with family in Colorado and Maine. The Carl Mazzio Memorial Trombone Scholarship is being established in his honor to be given to a trombone student studying at SUNY Fredonia. The Buffalo Philharmonic Orchestra has a long legacy of performing concerts for area school children. This school year the BPO Youth Concerts are featuring a blend of music and visual arts. WBFO’s senior reporter Eileen Buckley takes us inside Kleinhans Music Hall where some young Buffalo Public School children started their day with a lesson on how the power of music changes emotions. First graders from 13-Buffalo schools were completely engaged in the music, some waving their arms like conductors. Students represented a cross section of city schools that included the Bilingual Center, Lydia Wright School, Native American Magnet and International School 45. BPO Director of Education and Community Engagement Robin Parkinson tells WBFO News for the first time this year they’ve expanded the program. “Six days of concerts that we are giving for the Buffalo Public Schools. We have the first, second, third, fourth, fifth and sixth graders coming this year for the first time, so it’s a really remarkable and wonderful collaboration that we have with the Buffalo Public Schools that we are expanding,” explained Parkinson. The theme of the youth concerts is “Feel the Music”, a chance for students to learn how music expresses many feelings. A big screen was above the orchestra on stage. Students were asked about how their emotions changed when different selections were played. Buffalo Public School students & teachers fill Kleinhans Music Hall for the Youth Concerts. “The programs that are on stage are relevant and connect with what is being taught in the classrooms, both in the music classrooms, but also in the general classrooms, so each concert ties in with other subject areas and I think they make authentic connections – that’s our aim – is to show that music education is relevant and is connected to all other areas of learning,” Parkinson said. For some of the students it was the first time they’ve ever walked into a concert hall. As part of the education process, the BPO had a produced video that included an explanation of when to applaud. “When do you clap? Hmmm – that’s easy – you just clap when the whole thing is over,” stated the man in the video. “Oh it’s wonderful to introduce them to the orchestra, the instruments of the orchestra, to see real, live musicians who live in our community. Some of our parents are in the orchestra,” said Monica Stamkewicz, a teacher at School 45. She attended the concert with her students. “It adds so much to their social development. Just how to interact with kids from other places, how to be in the community, simple things, just how to sit, but still move without interrupting other people. They’re very active at this age, so teaching them it’s okay to move even though we don’t want them to disrupt other people,” Stamkewicz remarked. Buffalo school student artwork used with the BPO concert. Student artwork from Highgate Heights, West Hertel, Southside and the Arthur Eve School was also incorporated. It featured adorable drawings by children displaying all kinds of emotions and sparked response from the children in the audience. Students got charged up and reacted as the orchestra played to a slide show of many different bulldogs. Last year the BPO served more than 40,000 students with youth concerns. This year the goal is to expand to 50,000. “And we hope to obtain that especially knowing that we’ve already gained two grade levels from the Buffalo Public Schools to attend the concerts this year,” Parkinson noted. Many of the children even dressed for the concert. Some of the girls wore fancy dresses. Olmsted first grader Henry Russo wore a tie and sport coat and was all smiles as he exited the concert. Olmsted first grader Henry Russo wore a tie and sport coat and was smiles as he exited the concert. “So was this the first time you’ve gone to the Buffalo Philharmonic?” asked Buckley. “Yes!” replied Russo. “For many of these first graders, this is the first time they will hear a live concert,” said Parkinson. The BPO’s education director noted that for these students the concerts are a lasting memory. “I can’t tell you how many people come up to tell me – adults – to say that they remember the first time they walked into Kleinhans Music Hall for a Youth Concert, so this a huge part of our legacy that we leave for Buffalo,” remarked Parkinson. JAMES STRECKER: If you were asked for 50 words for an encyclopedia to summarize what you do, what would you say? JOANN FALLETTA: As a conductor, I am a catalyst who energizes and enables the superb team of the orchestra. I establish a landscape where excellence can flourish. I must find the perfect synthesis of leading 100 musicians and allowing them to be free at the same time. JS: What important beliefs do you express in your work? JF: In my work, I express my belief in the people around me- in their talent, their dedication, their excellence. I also celebrate and honor the extraordinary legacy of the music we play together- one of the greatest expressions of human creativity of all time. JS: How have you changed since you began to do creative work? JF: I am increasingly fascinated by the fluidity, the endless possibility in the pieces we play, and I am determined to let the result be informed by the unique personality of the orchestra. Each orchestra has a distinct character, sound, and way of making music, and allowing the musicians to imprint that uniqueness on each performance and recording is much more interesting to me than imposing a rigid interpretation. JS: What are your biggest challenges as a creative person? JF: My greatest challenge- in a large group like an orchestra- is finding a way to help every person feel intensely valued individually. JS: Please describe at least one major turning point in your life. JF: When I was appointed music director of the Buffalo Philharmonic, I felt that it was a major turning point for me. I inherited an orchestra with both a glowing artistic legacy and a troubled financial situation. The responsibility I felt to the musicians and the community was enormous, and it helped me develop as both a musician and an artistic leader. JS: What are the hardest things for an outsider to understand about what you do? JF: The hardest thing for an outsider to understand about what I do is how the musicians and I communicate with each other. Many times people ask me questions like “are the musicians really able to watch you?” Or “after the week of rehearsals, does the orchestra still need the conductor to be on stage?” It would be astonishing for them if they could realize the intense wordless communication between conductor and musician- expressed through gesture, eye contact, body language, facial expression and baton technique. JS: How and why did you begin to do creative work in the first place? JF: I have felt like a musician since I was seven years old and began to play classical guitar. There was not really a conscious choice for me- at some point I simply realized that music was who I was. JS: What haven’t you attempted as yet that you would like to do and please tell us why? JF: I continue to try to introduce our listeners to music they might not know- either from the past or contemporary music. I like to “open a window for them”, to help them make discoveries that will interest and delight them. But I always incorporate these new journeys into programs of composers that they know and already love. So it is a process that continues….there are many new pieces that I look forward to performing for them! JS: What are your most meaningful achievements? JF: Being a music director and helping the community to know, to value, and to love the orchestra more each season. JS: What advice would you give a young person who would like to do what you do? JF: To be prepared for a journey of hard work, complete dedication, many disappointments, countless surprises, and ultimately a life spent in the midst of the greatest beauty imaginable. To paraphrase one of my heroes, Leonard Bernstein: “the musician gives away his energies and his life just to make sure that one note follows another inevitably”. That has been the great privilege of my life. JS: Of what value are critics? JF: Critics are very valuable for the performing artist. They put our work in context. They can see the forest, while we are often concentrating on each tree and every leaf. They force us to step back and see and hear through the audience’s eyes and ears. I have learned a great deal from reviewers and critics who have taken the time to truly listen to us. JS: What do you ask of your audience? JF: The best audience is one who is open-minded, who is willing to let go and surrender themselves to the experience of listening, who does not worry about “knowing about the music” but is able to simply relax and “cross the bridge” to an island of tranquility in the midst of a very hectic life. I believe that each audience member feels very different- emotionally and physically- after sitting in the middle of music for two hours. Something changes inside each one of us- impossible to explain, but very real nonetheless. We often lose a sense of humanity in the everyday difficulties of life- and can find that humanity again, wordlessly, in a concert hall. JS: What specifically would you change about what goes on in the world? JF: Every child would be given the chance to hear and- most importantly- play music from the earliest possible age. Music and art education would be a priority in every level of education. I really believe that people who come to know and treasure music are the most open, most inclusive, compassionate human beings. The very ambiguity of music is part of its beauty- and an appreciation of that ambiguity can foster a true understanding of others, and an acceptance of difference. JS: If you could relive one experience from your creative life, what would it be and why would you do so? JF: I would like to go back to my seventh birthday and take my first guitar lesson with Mr. Cavadias again. JS: Tell us what it feels like to be a figure in the media. What effect does this presence have on you? JF: While I am really a shy person, I love the opportunity to talk about music. I want everyone to know that our music-making is for them, that the orchestra belongs to them. If I can open the door to the concert hall for them through a media presence, I am very happy. JS: Please tell us about one or more projects that you have been working on, are preparing, or have recently completed. Why do they matter to you and why should they matter to us.